This hotel’s location is next to nothing. There’s hardly any restaurants around. You have two options, either buy food from the town and bring it in or pay a fortune to eat a local food at the restaurant inside the hotel. Everything in the hotel is very expensive and I’ve never seen a single customer at the restaurant, even the hotel’s mini mart is overpriced. I wonder how unfresh their food would be. This hotel is also not next to the beach. It’s a drive to the beach, you can’t walk there. I don’t recommend this hotel to anyone. Lots of stairs, taxi to the beach, and the toilet backed up on the first use. Wonderful hotel and comfort. It is a bit far from the city but they have a shuttle to take you following a set schedule. We had an amazing view from our hotel room. The pool had a beautiful view as well. The front desk staff were not helpful. Upon arriving, a bellman stopped me in the middle of the lobby to ask me for my passport and then walked me over to the front desk and handed it to the lady. Why? There was no line. They required a cash deposit for a room that had already been paid for by credit card. They wouldn’t take another deposit from the card and insisted on cash. Upon checking out, they make you sit in the lobby while they check the room. There was no problem with the room, but I had to argue with them to get my deposit back because I couldn’t find the receipt they gave me for the deposit. Make sure you hold this receipt because they try to hold your deposit if you don’t have it even though they log it in a book. The room was nice, but had not been finished being painted. The best part was the view. The breakfast was good. They had a free shuttle to the mall and beach three times a day. The hotel location is a bit far from anything so you kind of need the shuttle. While hotel location is good the hotel staff have 0 communication skills, they don’t understand English and some of them are extremely rude and so not helpful! I don’t understand what’s the point behind staying in a resort and paying a load of money for room to eventually get room on 3rd floor with no elevator! And the balcony is blocked by huge wall with a huge electric generator on it! The room description said a resort view which usually means a garden, a pool perhaps the buildings of hotel but not a wall with annoying generator and these are for all the rooms that have resort view! So make sure if u are desperate and need to book this hotel to at least save your vacation and book sea view! The hotel has a tour service desk who has been giving us misleading info all our stay there... wanted to do tours to islands (James Bond and Phi Phi) and he always said the only way to go there is by booking through agent to discover later that you can actually go to the pier book your own ticket and save loads of money! So make sure not to book your tours from this desk. The breakfast has loads of variety but unfortunately every single dish had pork in it except for the egg and croissants :p I don’t eat pork on Bkfast and I know some people don’t eat pork in general so some consideration for vegetarians as well! Overall the hotel doesn’t worth the money paid which is considered one of the expensive in Its area and definitely not a 5 stars! I advice to check other hotels in Patong. The hotel in overall experience rated higher in my assessment than several other hotels I have stayed in during my past visits to Phuket. The location was a little away from the 'market places' and the main beach of Phuket but it would be more than welcome to a visitor who is ready to trade the din and bustle of city life for the tranquility in the serene surroundings of Kalima Resort. The breakfast menu of the hotel is incredibly sumptuous and the rooftop ambiance overseeing the sea is splendid. Beautiful hotel, very comfortable, clean, relaxing. Had some difficulty communicating with staff, but def enough to get by. Only other con was my shower didn’t get hot, other than that great stay at Kalima! A little away from the beach. but was able to rent a bike outside hotel and get around. Kalima is an amazing resort! I would stay again and recommend to all of my friends and family. Food was amazing, and not very expensive. Alcoholic beverages were awesome and did I forget to mention BUY 1 get 1 FREE?! Omg who does that? The view no matter where you went was gorgeous! Now for the bad things... We got the double pool access (amazing) however, being my honeymoon I wanted a little more privacy from my neighbors upstairs, maybe a longer balcony for them so they can't see me in the jacuzzi part of the pool. The bathroom was not bright enough in the shower, we took late night showers and it was fairly dark even with alllllll of the lights turned on in there. The Thai restaurant wasn't all that, and very expensive for mediocre food. Malika was delicious though. Over all a romantic location and close to the beach, keep up the good work kalima! The second we got to Kalima we were greeted with warmth and communication. Jessie went out of his way to make sure all our questions were answered and everything in our hotel room was perfect. We stayed in the Pool Access room which I highly recommend. There's an outdoor shower and private pool out from which stays very clean. We couldn't get our audio on our tv to work when we arrived - they literally sent someone up within a few minutes. The audio was fine, we just couldn't figure out how to use the tv :)! The view is breathtaking and the breakfast is out of this world. There's a few cute restaurants too down the road if you want to get outside the hotel, but the hotel cuisine is delicious too. Great trip! Beautiful location...just wish there was ocean access nearby. I'm usually don't like to Come back to the same hotels but this one I'll definitely be back next time when I'm In Phuket .Huge rooms,great pool with amazing views ,friendly staff. I just wanted to send out a Big Thank You to Chev and the entire staff at Kalima Resort & Spa. This was our first time staying here but definitely not our last. Chev the assistant front desk manager went over and beyond to make sure we had everything we wanted and more. Kalima is much bigger then we expected with very amazing pool villa suites with breathtaking ocean views. Breakfast buffet was huge with a wide selection of exotic fruits, and food to choose from. We absolutely loved everything about our stay at Kalima and I comfortably recommend them to everyone. Great hotel located 10 min away from Patong center. Quiet.. great value..Pool is awesome with bar pool and view is breathtaking specially from rooftop restaurant..there's a shuttle bus to patong city.. just not that frequent taxi is 300thb to beach..
My experience was both good and bad... It was nice that we could check in early (around 1pm instead of 3pm). But, I have to come back to the front desk again to change my room because the room was smelly and we were not comfortable staying in the room. They were kind enough to put us on a higher floor (not smelly) room without any issue. We had GRAND DELUXE SEA VIEW, but the sea view was blocked by number of telephone poles right in front of the room and side window of the bathtub area was covered with bamboo trees. I guess you can see the sea without any obstructs if you are on the highest floor and on a corner unit (which is a very rare thing....). But the room itself was very spacious for two of us, and we enjoyed the large comfortable bed. Infinity pool was nice and big. But if you want to have some privacy or quiet moment, I recommend you to go to a smaller pool on a hill (near mini-golf course). Complementary breakfast was good and the restaurant has a nice view overlooking Patong area. Overall, I think you can find a better hotel for the value in Phuket. But, the hotel is not too bad. Patong Beach is within 2 miles (3 km) of Kalima Resort & Spa, Phuket while other popular attractions such as Jungceylon Shopping Center are within 3 miles (5 km). This 190-room, 5-star resort welcomes business and leisure travelers with 2 outdoor pools, a full-service spa, and a restaurant. It's connected to a shopping center in central Patong and also close to Kamala Beach and Bangla Road. Enjoy a bite to eat at the resort's restaurant, or relax with a drink at the bar/lounge. Savor a meal from the privacy of your room with 24-hour room service, or get a pick-me-up at the coffee shop/café. Start each morning with buffet breakfast, available for a fee from 6 AM to 10:30 AM. Guests can expect to find free WiFi and 32-inch an LED TV with satellite channels and a DVD player. Beds are dressed in premium bedding and down comforters, and the bathroom offers a hair dryer and free toiletries. Other standard amenities include a balcony or patio, a refrigerator, and a minibar. 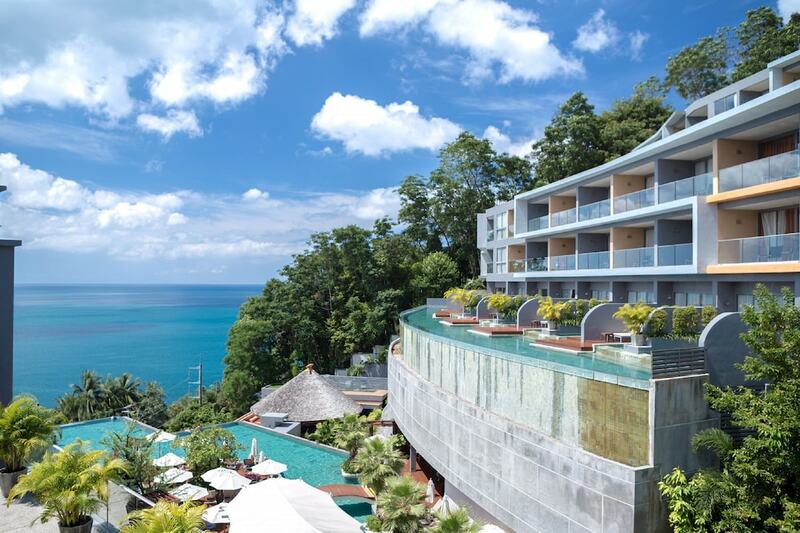 Guests of Kalima Resort & Spa, Phuket have access to a full-service spa, 2 outdoor pools, and a children's pool. There's free parking and limo/town car service. The front desk has multilingual staff on hand 24/7 to help with luggage storage, dry cleaning/laundry, and securing valuables. Other amenities at this luxury resort include a fitness center, 4 spa tubs, and a sauna. Dear Sir/Ma'am, Greetings from Kalima Resort and Spa! We would like to thank you for taking your time sharing your feedback about your recent stay at Kalima Resort & Spa, also thank your for choosing Kalima as your option for your destination of your holiday. I will share your feedback to our staff and management knowing that you enjoyed your holiday with us. Best Regards, Blessie in behalf of Kalima Resort and Spa Management Team! Malika Terrace - Restaurant and bar with ocean and pool views. Open for breakfast, lunch, and dinner. Kid's menu available. Thai Taste - Fine-dining restaurant with ocean and pool views. Open for dinner. The resort has 2 outdoor swimming pools and 4 spa tubs. A children's pool, a sauna, and a fitness center are other recreation options. The preferred airport is Phuket (HKT-Phuket Intl. ): 29-min drive, 19.2 mi/30.9 km. Book a stay in any room or rate plan and receive use of a Handy Phone (portable WiFi device) during your stay. The Handy Phone includes the following: digital city guide, free 3G Internet, free international (6 countries) and local calls, speed dial to hotel services, and various local discounts and offers.